At CAE Healthcare, we care about our customers getting the most out of your simulator(s) easily and efficiently. That is why we have started an engaging new Tips & Tricks blog series. 3. Take the cut pieces and assemble as shown (Fig. 1) using the 2 ½” coarse thread screws (wood studs) or the self-drilling screws (metal studs). You may have to pre-drill pilot holes when using wood studs. 4. In the three voids made in the middle of the assembly (Fig. 1), install the wall plates per manufacturer instructions (you ay need to alter the order of steps to accommodate for the installation instructions). 5. 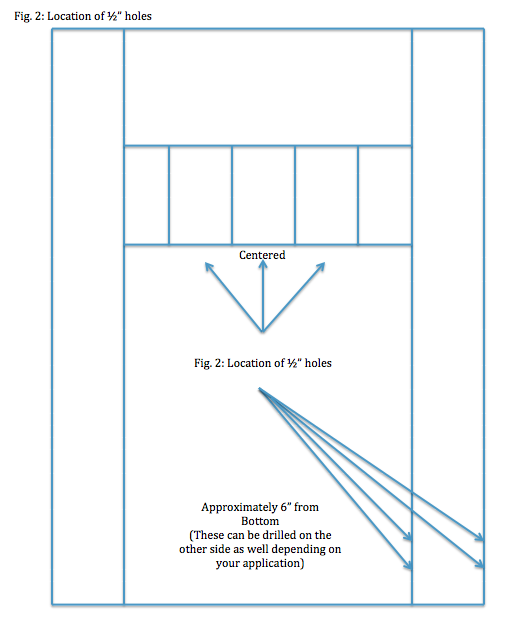 Drill ½“ holes where indicated (Fig. 2). This will be for the tubing that will pass through the headwall and feed air to the system. Make sure to place rubber grommets into the holes if you are using metal studs. This will prevent chafing of the tubing. 7. Route the air hose through the holes drilled at the bottom of the unit and up to the gas plates. 8. At the first gas plate, cut the air hose and install the barbed “T” fitting. 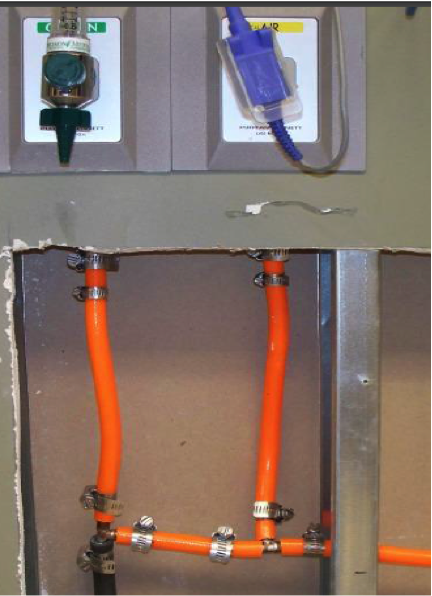 Install a short piece of air hose vertically to the wall plate and affix to the input tubing coming off the wall plate (see photo below). Affix another short piece of air hose to the horizontal side of the barbed “T” piece and run that to the input tubing of the other gas wall plate. Secure all fittings with ½” hose clamps. 9. Utilizing the same procedure (minus the barbed “T” piece), Route the ¼” PVC tubing up to the suction Wall plate. Affix this to the input tubing of the suction wall plate. Secure with the 3/8” hose clamp. 10. Cover entire unit with the sheet of drywall and affix to frame using 2” fine thread drywall screws and trim where needed. Make sure to trim out the openings for the gas and suction finish plates. 11. Paint entire unit to desired color. 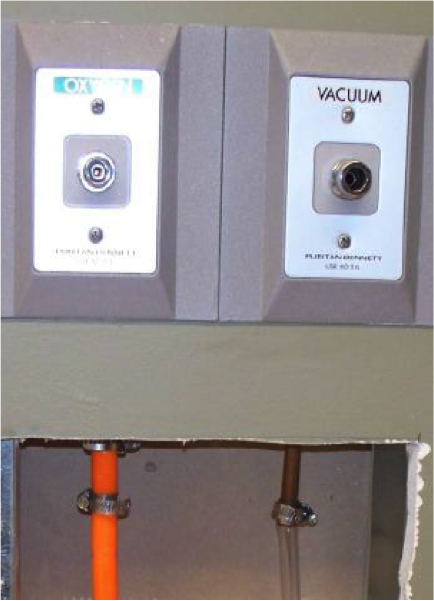 Attach gasses and suction finish plates according to manufacturer’s instructions. 12. 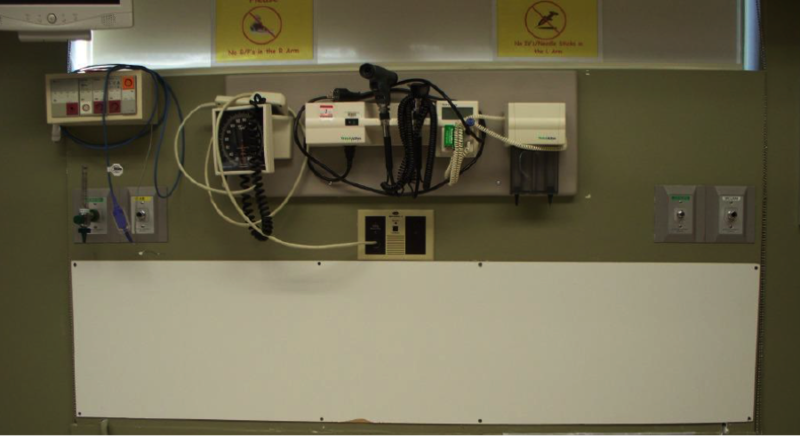 Install headwall unit to desired location. 13. Attach distal end of air hose to compressor and distal end of suction tubing to portable suction machine. These can be placed against the floorboards. On the compressor, regulate the PSI to around 50 PSI. This is a standard setting for O2 and Room Air within hospitals. Higher pressures may damage equipment. Tubing running out of the frame may be ran through the walls if desired to hide it from view. 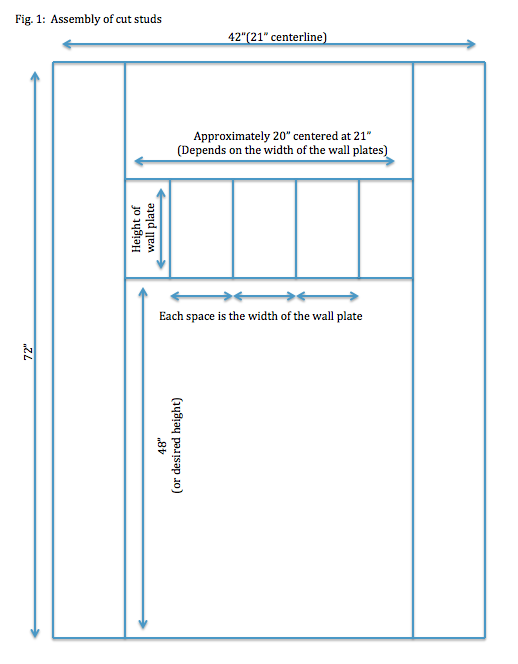 Mark the headwall in a desired fashion: “FOR SIMULATION USE ONLY“. This is a safety measure. If you are running a ventilator, make sure to set the FiO2 to 21% on the ventilator setting. We hope you enjoyed this tip! Questions or comments? Please feel free to post below! If you would like more information on utilizing your CAE Healthcare simulator's features, visit the Video Tutorials section.